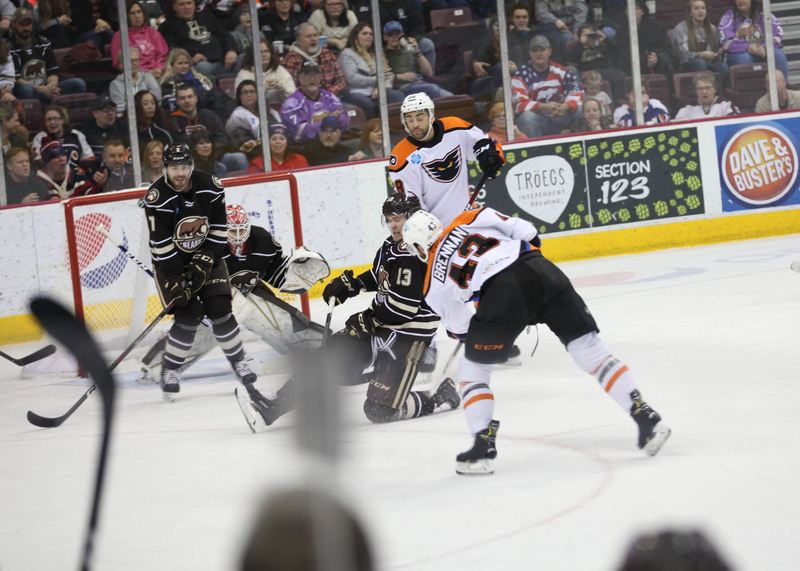 The Hershey Bears beat the Lehigh Valley Phantoms 2-1 Saturday night in Hershey. The win improves the Bears record to 22-20-0-3 on the season. The Bears are back in action on Super Bowl Sunday afternoon when they host the Belleville Senators at Giant Center. Puck drop is set for 2:00 PM. The Bears started the scoring with a goal from Nathan Walker midway through the opening frame for a 1-0 lead at the first intermission. Ryan Sproul would give the Bears a 2-0 lead early in the middle frame, but the Phantoms would respond, making it 2-1 at the second intermission. The final frame would go scoreless. Bears win 2-1. Scratches: Colby Williams (lower body), Lucas Johansen (upper body), Kris Bindulis (upper body) were the injury scratches. Max Kammerer and Mason Mitchell were the healthy scratches. Lucas Johansen returned to practice on Friday January 25 and is currently listed as “day-to-day”. He has been out of the lineup since November 23rd. The Bears struck first with a goal from Nathan Walker at 8:21 of the opening frame. This was Walker’s 11th goal of the season. and second consecutive game in which he registered the game’s first tally. Aaron Ness (28) and Tyler Lewington (6) were credited with the helpers. That would be all of the scoring in the first 20 minutes. The Bears dominated most of the play in the opening frame, out-shooting the Phantoms 12-4. The Bears were 0 for 1 on the power play and the Phantoms 0 for 0. The Bears would add to their lead with a goal from Ryan Sproul at 3:23 of the middle frame. Juuso Ikonen (9) and Steve Whitney (4) were credited with the assists. But the Phantoms would quickly cut the Bears lead back to a single goal with a tally from Carsen Twasrynski at 8:19, making it 2-1 Bears. Prior to the goal, Mike Vecchione laid a very questionable hit on Mike Sgarbossa along the boards, but no penalty was called. You can see O’Brien going after Vecchione (21) in the goal video above. Both Riley Barber and Liam O’Brien were called for penalties on the retaliation, giving the Phantoms a power play, but they were unable to tie the score. The Phantoms were later called for a slashing penalty on Dale Weise and Philippe Myers was given a 10-minute misconduct penalty for abuse of an official at 13:02, but the Bears would be unable to capitalize on the man advantage. The second period would expire with the Bears leading 2-1. The Bears outshot the Phantoms 12-7 in the second period, and led 24-12 after 40 minutes of play. The Bears were o for 4 and the Phantoms 0 for 1 on the power play after two periods of play. The Bears would be the benefactors of a 5-on-3 power play early in the final frame, but once again, would be unable to capitalize on the man advantage. Beck “The Check” Malenstyn dropped the mitts with Philip Samuelsson midway through the final frame. The Phantoms would get a power play with just over three minutes remaining when Liam O’Brien was whistled for boarding, then Tyler Lewington was called for high sticking, giving the Phantoms a 5-on-3 for 1:20 of the final frame. The Bears would kill the penalty, and hang on for 2-1 win. Hershey has scored first in 13 of their last 14 games. Bears have points in eight straight games. Aaron Ness led the Bears in shots with 5. Bears outshot the Phantoms 33-22. Samsonov stopped 21 of 22 for a .954 game save percentage. Bears were 0 for 5 and the Phantoms were 0 for 4 on the power play. Always sweet to be in the suite for a Bears game. This entry was posted in News and tagged Hershey Bears, Jon Sorensen, Lehigh Valley Phantoms, Nathan Walker, Ryan Sproul. Bookmark the permalink.